The Nang Loeng Market in the Nakhon Sawan 6 Alley, a short 10 minutes walk from the Phanfa Bridge Pier, is one of my favorite markets to go to in Bangkok, primarily to dig inn on the great street food. The Sai Krok Pla Naem version served at Mae Lek is a rather rare dish in Bangkok these days, and nobody does it better. Mae Lek and one of her local clients. The Shell Shuan Shim award to be seen top right of photo. The wet market part of Nang Loeng Market is a rather small one today, but there are plenty of good eateries to check out, including dessert stalls. All situated around a cantina like seating area in the middle of the market. But my focus this time is Mae Lek, as close to an institution as it can be in this older part of Bangkok. The dish consists of rice and sausage, snake head fish crumble with some herbs, garlic and crushed peanuts, a couple of small chilies and leaves of salad to pack it all inn. The fish crumb is made from fish that is fermented for a day or more in order to add a sourness that balances the slight sweetness of the sausage very well. By the way, there is no taste of fish at all in this dish. The Sai Krok Pla Naem at Mae Lek might look like a simple dish, but I can assure you, the truth is the complete opposite. It taste just great and has a complexity to it. A true eating-with-your-hands snack I think everybody will love. Mae Lek meets any new visitor with interest and a sharp evaluating look through the teacher-like-type of glasses, having served the local community for decades. 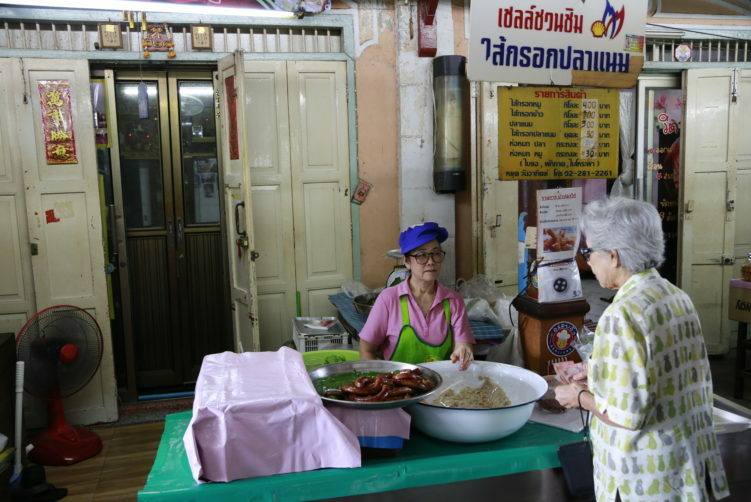 Most of them probably able to sleepwalk their way to her stall, ordering the delicious Sai Krok Pla Naem. Anyway, she close her stall 2 pm or when she is sold out. Most locals line up well before that in front of this humble stall. A table, a plastic chair, what looks like an old washing pot, a serving plate, a couple of posters with information and the Shell Shuan Shim Award above that. And not just any Shell Shuan Shim sign. This is the old sign from the time when the Shell Oil Company was the sponsor for this prestigious award. Not many stalls left with the old Shell Shuan Shim sign in Bangkok. It is equivalent to the Michelin guide or Zagat for Thailand and something you should look out for when walking the streets of Bangkok. 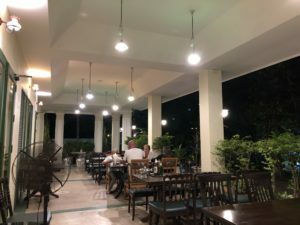 It’s a far more precise guide to good food in Thailand than the Michelin Guide as you will see from my review of the Michelin guide Bangkok that came out in December last year. You are not served the food in a bowl or on a plate at Mae Lek. You get it all served in plastic bags to bring home or to the cantina-like-setting in the middle of the market hall. So, what do you do? 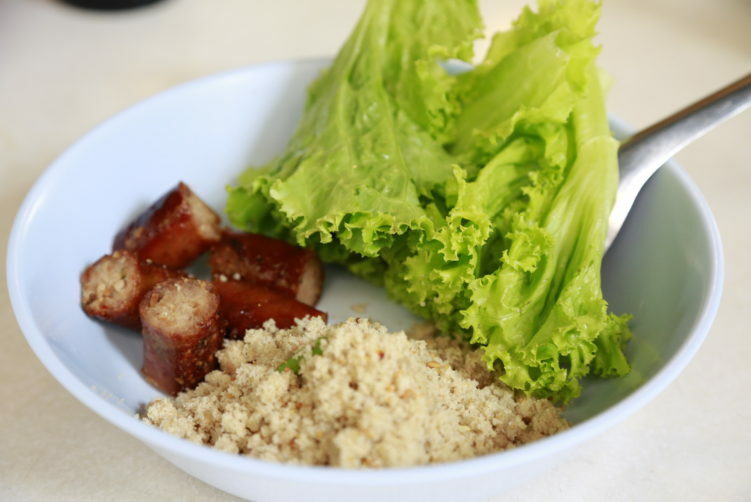 You take a leave of salad and fill it with rice, crumble, herbs, garlic etc (already mixed for you by Mae Lek), a piece of sausage before you pack the leave around it and stick it into your mouth. A real snack. A real treat. Just delicious. Partly sweet, sour, spicy and bitter with none of them overpowering the other. This treat will set you back 50 bath. By the way, you don’t get the food on a plate, but in several small plastic bags. Go to one of the other stalls and order something and you get an extra plate. If you’re ready to discover more of the street food in Bangkok, please have a look of my Bangkok food map to see if a good vendor is near you. You could also check out my article on the Michelin Guide recommendation for Bangkok as the guide has quite a job to do on the street food scene. The Thai word Mae as used here at Mae Lek can be translated to mother. It is normally used to indicate that the food sold at the shop is based on old recipes, in other words quality food that has stand the test of time. How to get there: No BTS or MRT here. Taxi or walking is the two options. Buss number 5 or 171 are alternatives. If you’re down-town and close to Saen Saep canal, an option is to use the canals and take the boat taxi to Panfa Leelard pier (end pier) – takes about 7-8 minutes from Hua Chang pier (Ratchatewi), then 7-8 minutes of walking to the Nang Loeng Market. The Nang Loeng Market in the Nakhon Sawan 6 Alley, a short 10 minutes walk from the Phanfa Bridge Pier, is one of my favorite markets to go to in Bangkok, primarily to dig inn on the great street food. The Sai Krok Pla Naem version served at Mae Lek is a rather rare dish in Bangkok these days, and nobody does it better. See full review at StreetsideBangkok. The museum is dedicated to Thailand’s King Rama VII (1893 – 1941) and includes exhibitions on both his personal life and political life. He was the last absolute monarch and the first constitutional monarch of the country. His reign was a turbulent time for Siam due to political and social changes during the Revolution of 1932. He is to date the only Siamese monarch of the Chakri Dynasty to abdicate. His main fault was to underestimate the Bangkok’s elite and it’s demand for power to safety their positions. He died in Exile. Open: Tue – Sun 9 am – 4 pm except on public holidays. Admission: 20 bath for Thai’s and 40 bath for foreigners. Website: More information to be found here. How to get there: There is no BTS or MRT here. An easy option if you’re down-town and close to Saen Saep canal, is to use the canals and take the boat taxi to Panfa Leelard pier (end pier) – takes about 7-8 minutes from Hua Chang pier (Ratchatewi) or about 15 minutes from Nana. It is 20 meters away from the Panfa Leelard pier. 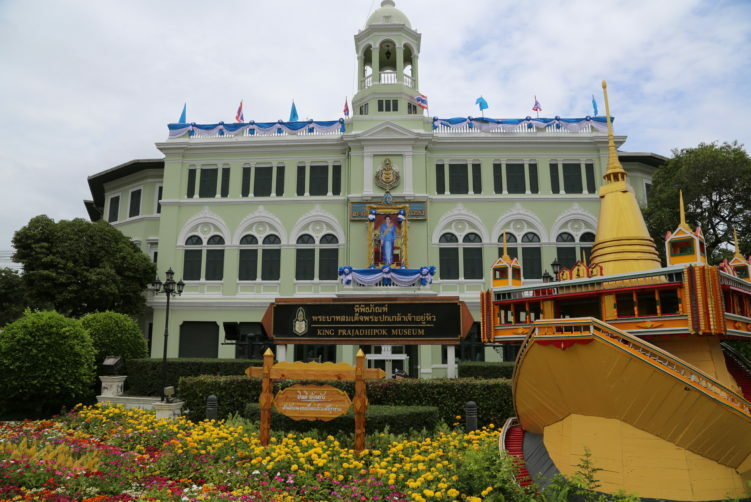 The museum is dedicated to Thailand's King Rama VII (1893 - 1941) and includes exhibitions on both his personal life and political life. His main fault was to underestimate the Bangkok's elite and it's demand for power to safety their positions. He died in Exile.